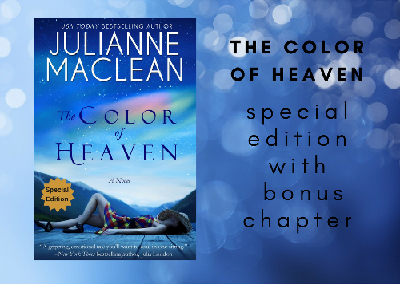 If you're new to my newsletter, you'll receive a free download of The Color of Heaven - Special Edition, which includes bonus scenes not included in the original published book. This is for newsletter subscribers only. You will receive an email from me within twenty-four hours with instructions about how to download your free book. 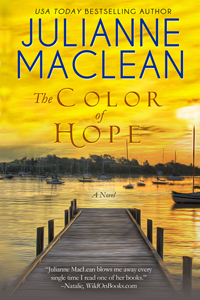 This month I'm giving away a signed print edition of THE COLOR OF HOPE to one lucky newsletter subscriber. Good luck. This giveaway is a special offering for my newsletter subscribers. If you’re not a member of my newsletter list and you want to enter the giveaway, you can fill out the form below, and the pink “subscribe” button at the bottom will add you to my newsletter list, and also enter you in the giveaway, so your entry will count this month. As a newsletter subscriber, you’ll be the first to learn about new and upcoming releases, and you’ll hear about other special offers like audiobook giveaways and free eBook alerts. I’ll also share news about my writing life with you. New subscribers also receive a welcome gift: a free download of THE COLOR OF HEAVEN – SPECIAL EDITION, which includes a bonus chapter that was not included in the original published novel. You will receive an email from me within twenty-four hours with instructions about how to download your free book. Stay informed about new releases, events, giveaways, and cover reveals PLUS receive three free ebooks: The Color of Hope, The Color of Destiny, and The Color of Hope. As soon as you subscribe, an email will be sent to you with instructions about how to download your free ebooks. Julianne respects your privacy and your email address will never be shared with anyone.